Osaka is a metropolis with the second largest population after Tokyo and is famous for its lively cityscape. The convenient public transportation makes various locations accessible. 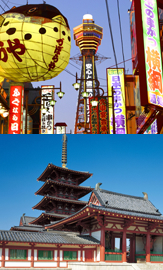 Osaka is an entertainment city with a varity of tourist facilities. The city is also known as a Japan's leading "city of cuisine." Umeda district　Shopping in a town where the cutting-edge trend is found. Namba is a vibrant town where one can experience the unique culture of Osaka. 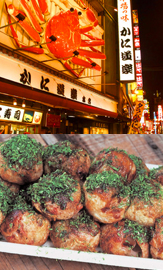 In Dotonbori, the streets are lined with colorful signs, and one can enjoy Osaka's cuisine such as takoyaki and okonomiyaki. Shinsaibashi, with various luxury brand boutiques, is known as a source of youth culture. 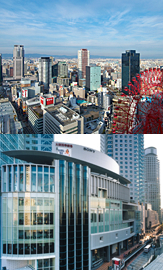 Namba is renowned as a multifaceted attractive town. Connected to Nagahoribashi Station, located in 6 minute walk from Shinsaibashi Station. All rooms are equipped with free Wi-Fi (wireless LAN). 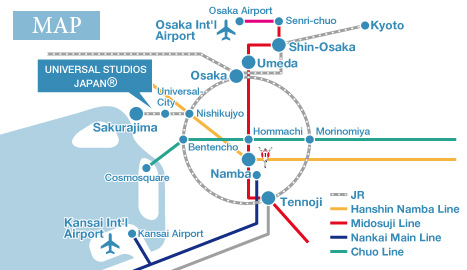 Located in the center of the southern Osaka and it is easy to access from Shin-Osaka or Osaka Station. 10 min walk from subway Namba station/5 min walk from subway Daikokucho station. 1 minute walk from Shinsaibashi station on subway Midosuji line! Wlking distance to Dotonbori and American Village. 1 minute walk from Nagahoribashi subway station exit. All rooms are equipped with free Wi-Fi (wireless LAN). Nest Hotel Shinsaibashi is a large-scale, multi-purpose business hotel situated in Shinsaibashi, the heart of Osaka. 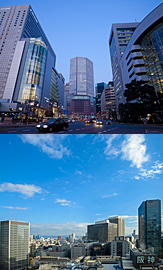 Umeda is known as a cutting-edge trendsetting town of fashion, amusements, and the arts. The town is perfect for shopping and leisure with a variety of shopping malls and department stores, including Grand Front Osaka, which opened in 2013. A city hotel equipped with an entire spectrum of urban functions, the Hotel Granvia Osaka is directly linked to JR Osaka Station. Check-out at 12:00. Conveniently located with 3 minutes walk from JR Osaka station! Above subway Higashi Umeda station on Tanimachi line/7 min walk from JR Osaka station. Facing to the main entrance of Shin Osaka station. 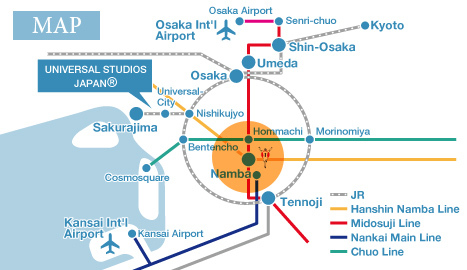 Easy access to urban Osaka, Kyoto, Kobe, using JR and subway lines! 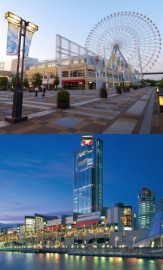 ANA Crowne Plaza Osaka is located in the central of Osaka, known as a city of water, and is overlooking Dojima river. Very convenient for visiting both on business and entertainment purposes. Situated at Nishi-Umeda in Osaka, the hotel markets itself as an urban resort hotel. The Tennoji/Abeno District has touring spots such as a zoo, museum, temples, and shrines, as well as huge shopping malls. The whole area is like an amusement park. Abeno Harukas, Japan's highest skyscraper rising 300 m aboveground, opened in 2014, and has been drawing attention as the new face of Osaka. Directly connected with Tennoji Abenobashi Terminal, Tennoji Miyako Hotel is good location as a base of Kansai tourism. The Osaka Marriott Miyako Hotel occupies 38th to 57th floors of "Abeno Harukas". Only 30 minutes by train from Kansai airport. A port town in Osaka that has flourished because of the fishery and commerce through the ages. Even now, the waterfront is crowded with a variety of touring spots that include Tempozan Big Wheel providing a panoramic view of Osaka, shopping malls, Universal Studios Japan®, and Osaka Aquarium Kaiyukan, one of the world's largest aquariums. Located in front of the gate, and the nearest to the theme park ! There are a lot of popular character spots in this hotel. All rooms are non-smoking. 40m2 spacious rooms (up to 4 occupants) also available, best for family groups ! All rooms are non-smoking. Located just by the side of the station, the high-rise hotel is equipped with a natural hot spring with good views. An official hotel, facing to the main gate of the park! Luxury hotel run by Tokyu Hotels. The main lounge with the waterfall and a gorgeous chandelier is famous for the wellhole style. 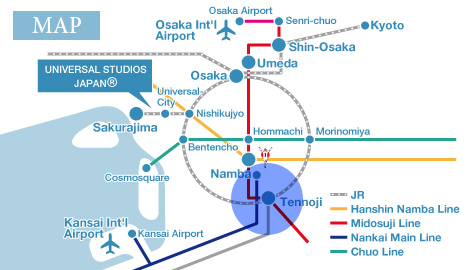 Osaka is a city that offers convenient public transportation via Itami Airport and Kansai International Airport, as well as Shin-Osaka Station, the terminus of the Shinkansen lines. 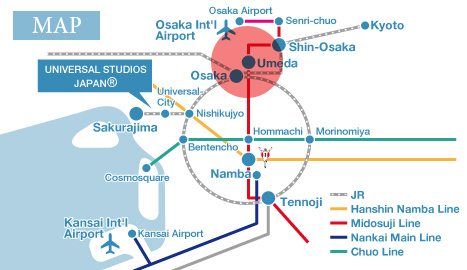 With subways, the JR Osaka Loop Line and private railways are convenient ways to travel throughout Osaka. Please see below for recommended accommodations as an easily accessible hub for sightseeing. About 8 minutes walk from Shin-Osaka Station. Free shuttle bus from Shin-Osaka Station is operated every 20 minutes. 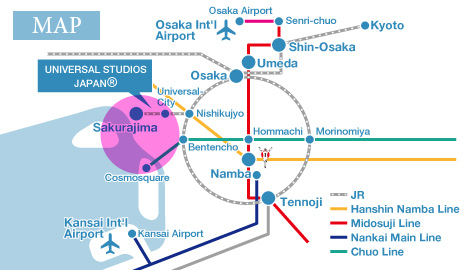 Hotel is located in Osaka Maru Building opposite to JR Osaka ｓtation and directly connected by the underground shopping arcade, and to JR, subway and private railway stations. This hotel is directly connected to Rinku Town Station, the front gate to Kansai International Airport, and 3 minutes walk from the station. Only hotel located at the Kansai international airport island with direct access to the airport terminal.